A dozen trucks arrived in Rotterdam after traveling across Europe in the European Truck Platooning Challenge. Six different truck makers participated: Scania, Daimler, Volvo, IVECO, MAN and DAF. 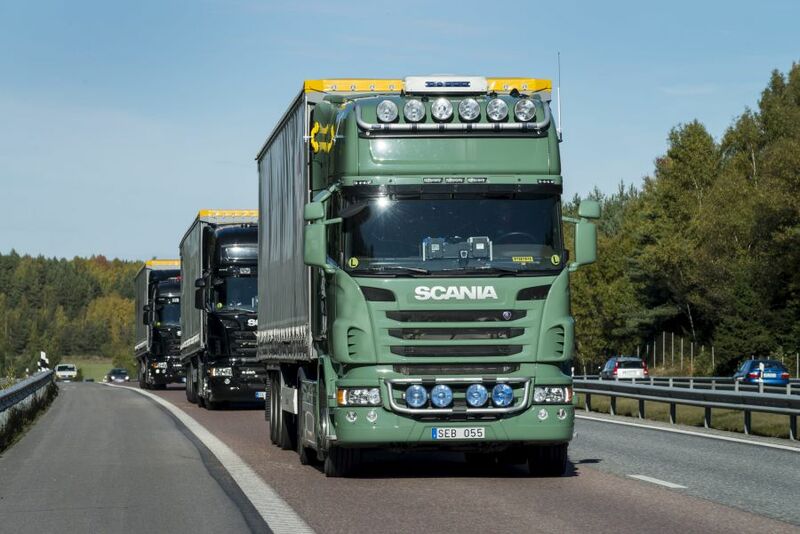 Truck platooning involves a convoy of connected trucks that drive and react as a single unit. Acceleration and braking are linked and controlled by computers and WiFi, allowing vehicles to drive much closer together without sacrificing safety while reducing drag and also the cost of drivers and fuel. Each of the six truck manufacturers demonstrated their own platooning technologies. It is estimated that fuel savings of up to 10% can be achieved with equivalent reductions in CO2 emissions by this type of slipstreaming. Each of the test vehicles was connected by WiFi, which allowed for the close platooning that wouldn’t be possible with human drivers. Trucks used an advanced Wifi-P connection, developed by NXP, and specially designed for automotive applications. The hi-speed WiFi system enables trucks to drive close together and communicate with each other. Everything that the driver in the first truck sees in front of him is projected onto a screen in the second truck. Truck platooning could happen within the next 10 years and most manufacturers are investing in the technology. Daimler recently announced it was investing more than $500 million into its truck platooning technology, and research reports have forecast that more than 7.7 million truck platooning systems could be on roads around the world by 2025.